Hold the Line is a modular tactical American Revolutionary war game that includes the following battles: Long Island, Harlem Heights, Weitzel's Mill,Trenton, Hobkirk's Hill, Eutaw Springs, Bemis Heights, White Plains, Kings Mountain, Brandywine and Monmouth. It’s obvious that there are a number of very popular simple and modular tactical war games out there. The C&C, M44, Battlelore, Battle Cry, Maneuver, Combat Commander and other games all fit the bill. I’ve always enjoyed playing these games and I actually own 4 of these games. I’m going to use C&C games as a comparison vs. Hold the Line. I’m not doing this to bash the C&C games but just because everyone is pretty familiar with the C&C games. Hold the Line, For Honor and Glory and Clash of the Continent from Worthington games actually have a lot of similarities to the Commands & Colors system. Both C&C and Hold the Line uses a blank map board that the terrain can be changed for each scenario. Both games are played until you capture some amount of flags or victory points (usually between 4 - 8). Both games take between 45 - 90 minutes. Both game systems have units that can usually take 4 hits to kill but in attack strength doesn’t decrease as a unit takes hits. There are slight difference between C&C and Hold the Line. 2. C&C games uses special dice and Hold the Line use regular dice. I prefer regular dice. I like to know immediately when I roll the dice that I’m hitting on 5 or 5-6. One of the things that drove me crazy about Battlelore was trying to remember if I’m hitting on green shields or blue swords. The dice in C&C, Memoirs and Battle Cry aren’t as bad but I still like looking for 6’s. Advantage Hold the Line. 3. C&C games use strategy cards to determine actions. Each general or army gets a certain number of strategy cards to choose from some cards are better than others. Some you’ll get to move and attack with a whole bunch of units and some you’ll only get to fire with 1 unit. Sometimes the attack will only be on one flank and other times you may only get to move 1 type of unit like the archers. Hold the Line uses Action Points. Each army starts with a number of action points 2 or 3 and then you’ll roll a d3 dice. So each army will end up with between 3 - 6 Action points per turn to use how ever they want. I know many people like the strategy cards of C&C games but I personally like rolling a d3 (I love games that use d3 dice). The strategy cards of C&C seem very gamey to me after playing the simplified Hold the Line Action Point system. The only draw back with the Action Point system is that you may find yourself only using small number of troops. When I played the battle of Harlem Heights the British Player only played with 6 of his 20+ units and I only used about half of my units. Advantage Hold the Line because it’s more fun and simple to roll a d3. 4. Use of Leaders. I love games were leaders are important. C&C games uses leaders to various degree. In Battle Cry the leaders are fairly important where there isn’t any leaders in the base Battlelore game. In Hold the Line leaders are critical. Leaders may force march troops. Leaders can also add bonus to attack and moral. A leader stacked with units can rally troops by using an action point. If an army unit is damaged and down to 1 strength the leader can raise it up to 2 strength. Since victory is based on how many units you destroyed, rallying units so they’re not destroyed can be critical to winning at Hold the Line. Perhaps the most important thing about leaders is that if you lose a leader you’ll lose 1 action point. So in Hold the Line you’ll have to balance out using your leader and protecting your leaders. Advantage Hold the Line. 5. Components. Both games have great components. C&C uses tiles, M44, BC and BL all use plastic minis. Hold the Line use heavy large chits. The chits are like 1" by 2". I’ll have to give the advantage to C&C. 6. Set up time. Because Hold the Line uses the big easy, to read chits vs. minis the set up time is very fast. One of the reasons I gave up on Battlelore was that set up to fun ratio wasn’t good. Battlelore takes 15-20 minutes to set up and put away and the game may only take 30 - 45 minutes. Hold the Line take 5 - 10 minutes to set up and put away for a 45 - 60 minute battle. Advantage Hold the Line. 7. Scenarios, maps and feel. For some reason many of the C&C game scenarios seem a little to generic to me. Two army’s line up with a few hill and forests mixed in and the then the armies battle it out. I think each Hold the Line scenarios seem a little more unique than the C&C scenarios. For example in the battle of Trenton, Washington has crossed the Delaware and has surprised the Hessians. The British Army is a complete mess in this battle. In the battle of Long Island, Washington must form an orderly retreat or get completely annihilated. Advantage Hold the Line. 8. Ability to play on teams. This is where CC:A and MM44 really shines. One of my favorite gaming experiences is playing Overlord CC:A or MM44 with 8 players. Hold the Line doesn’t offer this. Advantage C&C. #2. CC: Ancients (8.5) - Great unit mix (elephants to skirmishers). Overlord. #3. Battle Cry (8.0) - Simplest of the C&C games but it has a quick set up and leaders. Hold the Line is an outstanding game and I agree with all of your assesments above. I love the C&C system as well, but Hold the Line just seems to flow really well and every battle is always tense. A great game that doesn't get nearly enough exposure IMO. I hope they expand the system to different eras. Well, to each his own. Score one point of disagreement. And does it bother any of you that, outside a range of one hex, a unit in any sort of terrain--be it deep woods, a redoubt, or a barely there fence line, has zero chance of being hit by fire? Bothers me. I like HTL for what it is, but the comparison with C&C is thin, at best. I'd like Hold the Line better if the action points were more tied to the location of the leader and the action of the ordered units. 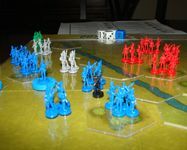 In Hold the Line as written, a player may order any of his units anywhere on the map regardless of where they are in relation to the leaders. - I think you should get a discount on the number of APs required to order a group of units if the group is close to a leader and the group all performs a similar action (e.g., move in the same direction or fire). - I think you should pay a penalty if the units are far from or out of sight of a friendly leader. I've thought of playing Hold the Line scenarios with a system similar to the Warmaster rules. That is, order one unit at a time and make a die roll. If you make your roll, the unit is ordered, if not, play passes to your opponent. You have penalties to your order roll if the leader is out of sight or too far from the unit being ordered. One thing that Hold the Line has over the Commands and Colors system is that soloing is easier--you don't have to ignore the cards your "opponent" has. I prefer C&C overall to HTL, but I have all the games in the HTL/Clash' system to date and am looking forward to the Mexican American War installment. Kent, what about doubling the points on an activation roll? Then a player can spend one point to activate the leader and each unit adjacent or in the same hex as the leader? Then two points for each unit that is further away, and three for each unit that is out of LOS of a leader due to terrain, not units? And maybe units that were activated out of LOS on the previous turn get a 1 point activation discount if subsequently activated again? The Warmaster activation idea also has merit. I think your comparison is weakened by the fact that you frequently lump the C & C games together. The only one I've played is Ancients (I've also never played HtL), and at times your criticisms of the C & C system seemed directed primarily against BattleLore and didn't apply to Ancients. This was particularly true of no. 4. I'd like to hear a comparison of how C & C: Ancients' use of leaders (which I like very much) compares to that of HtL. Do you give HtL the advantage over Ancients with regard to leaders, or were you mostly thinking of BattleLore? 7. Scenarios, maps and feel. For some reason many of the C&C game scenarios seem a little to generic to me. Two army’s line up with a few hill and forests mixed in and the then the armies battle it out. C&C pretty much has to do it that way because of the way the map is divided into 3 sections. That means you can't really have scenarios where, for example, one army starts in one corner and the other starts in the opposite corner because 2/3s of the cards would be unusable at the start. The C&C systems works best by having two lines facing each other that both go across all three sections. Not dividing the battlefield that way allows HtL more flexibility in initial starting positions. Wow. I can't believe I never thought of that but that's exactly right. It's part of the reason the C&C games seem more generic where HTL seems more historical. I hear you on this one. I had to look up the rule when playing for the first time because I was surprised that 6's weren't automatic hits but your right you have zero chance of hitting a unit from far distance in any sort of terrain. Perhaps it would have made more sense to take away 1 or 2 attack dice in different terrain vs. making impossible to hit a defender under cover. But how the rule is written keeps the game simple and makes defending with cover a much stronger position. This also makes it difficult and interesting to be an attacker against a strong defensive position. The battle of White Plains is an excellent example of this situation. The Americans are in a defensive line behind terrain and British have lots of units and must knock them from the defensive line to win. If the British player moves up a couple of units at a time they'll get mowed down by the Americans but if they use some combination of elites, cannons, close combat and overwhelming force they can knock a whole in the Americans line. I've edited my post to include my ratings for all 5 games. As you can see I rate all 5 games pretty highly HTL = 9.0, C&C Ancients = 8.5, Battlelore the lowest at 6.5. Part of the reason for this review was to tell people, if you like C&C games you'll probably also like HTL. I like how CC: Ancients uses leaders but I found the use of leaders vital in HTL. For example in the Battle of White Plains I mentioned above. The guy I was playing against sent wave after wave of British troops at my line. In each case I’d knock the unit down to 1 or 2 moral so the British player would retreat that unit back out of range and than have the leader rally the unit back up to a 4 for another attack. In the battle of Harlem Heights, I used one of my Generals to force march troops on a suicide mission to capture the victory points. It has the CC feel, but definitely a different gaming experience. I was gonna say something earlier about the close combat in terrain, but to me that was typical of the era.. you had to march forward in the face of a well defended volley and take the hits to get close enough to shoot a good shot. I enjoy the historical feel of HTL much better. CCA is a great game, but I just don't have the connection like I do with the HTL era. Its also inspired me to do a lot of research on that era, and that's the best part. Right now playing FIW (Another great era I knew nothing about) and Im also looking forward to moving into 1812 with For Honor and Glory, which has similar rules. I do enjoy using leaders in creative fashions like this, and some of the advanced rules add some fun with the leaders like adding to dice rolls. I really don't want to hijack the thread, but could someone compare Maneouvre to HtL as well? I know C&C as well as Maneouvre, and find HtL intriguing. Hold the line- Roll the dice to get action points, these action points are used to move and or fire units. Gameplay is sort of like memoir 44 without the cards. HTL is historical based. Variety- HTL has about 10 scenarios, Manoevre has 16 boards (4 are used randomly) and 9 armies. You see, what you've just done is make me give up the money I was going to save for C&C Ancients, and buy this instead. This game sounds very cool, and possibly easier to explain to new people (the activation points make more sense than the flanks which take too much time to explain on a first play through). I would go out and get some cheap minis or cannibalize my Risk set for them. Nice comparison/review. I have used viktory 2 plastic army men ($30 for 8 armies and boats, use poker chips to represent additional units) Peices are light and a little small. Manoeuvre feels far more abstract than C&C or HtL. There is no real sense of conducting a tactical battle action, like you get with C&C or HtL. I'm actually at somewhat of a loss to describe why I like Manoeuvre as much as I do, given my taste for historical simulations. The game is an enigma, but a highly entertaining one. But that's how most battles were fought in the times depicted in CC:A.
here are some 28mm Minis I found that fit the game well. Nicely done. I'm personally fond of all these games very much (except Battle Lore, which I have not played). KingPut, thanks for the great review! I have a dumb questions (I'm kinda new to boardgames other than sports simulations): what is a 'modular' game?